WhyHunger is proud of the impact of our work. We listen and respond to the needs of community-based organizations and social movements who are leading the way forward. Together, we are magnifying our impact and building solutions that transform and last. WhyHunger’s International Solidarity Fund invested $354,021 in strengthening existing and emergent social movements for food sovereignty through 12 community-based projects in 17 countries led by peasant, fishing, and Indigenous communities. By supporting local capacity building, shared learning, agroecological food production and leadership development, WhyHunger is helping communities to build power and organize globally. WhyHunger supported three regional gatherings of the Peoples' Agroecology Process attended by over 100 organizers, farmers, farmworkers and fisherfolk operating in communities across the U.S. These encuentros offer a space for organizing, shared learning and political formation as a way to accelerate and scale out the use of agroecological practices that produce nutritious food in harmony with the earth and build collective power. 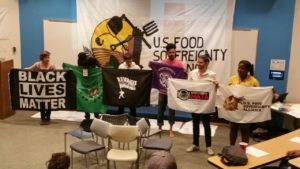 WhyHunger continued to accompany the US Food Sovereignty Alliance and helped shape, fund, organize its IV National Assembly attended by 117 members, allies, and individuals from 71 organizations and 7 countries. Building on 4 regional assemblies, this national gathering of farmworkers, food chain workers, fishers, family farmers, urban agriculturalists, and social justice advocates offered a facilitated space to set the Alliance’s direction and strategy to secure freedom and dignity through food sovereignty in the U.S. Through WhyHunger’s Rapid Response Fund, which provides immediate resources directly to our social movement and grassroots partners in the aftermath of a crisis, we continued to support the Puerto Rican farmers and community organizers working through Organización Boricuá de Agricultura Ecologica to rebuild local food and farm systems in the aftermath of Hurricane Maria. We also provided funds for food, seeds, and construction materials to Asociación Femenina para el Desarrollo de Sacatepéquez-AFEDES in support of the families affected by the Volcano Fuego in Guatemala. WhyHunger continued to deepen relationships with three global social movements working to build food sovereignty and social justice for all by mobilizing funds, coordinating learning exchanges, providing technical support and international solidarity to La Via Campesina International, World March of Women and the World Forum of Fisher Peoples. This support helps ensure communities are able to produce nutritious food, maintain their land rights and strengthen their ability to mobilize. WhyHunger continues to expand on the most comprehensive database of 26,357 food access organizations in the U.S., placing an emphasis on those that provide nutritious food. In 2018 we utilized whyhunger.org/findfood, our texting service and our WhyHunger Hotline 1-800-5HUNGRY to assist over 322,557 individuals in accessing healthy food and resources in their communities. WhyHunger hosted and accompanied members of La Via Campesina International through the final stages of a 17-year process to pass the UN Declaration on Peasant Rights by providing logistical and communications support. This historic declaration ratified by the UN General Assembly in 2018 is poised to change the landscape of human rights for one third of humanity who live, work, farm and build community in rural areas. WhyHunger provided over $330,000 in direct funding to help 48 organizations and community leader across the U.S. bolster initiatives around childhood nutrition, organizing, agroecology and story-based narrative strategy. By working to deepen local impact and build stronger connections regionally and nationally, WhyHunger is helping communities address their own immediate needs and increase their capacity to engage in long-term change. WhyHunger is actively supporting and stewarding the Closing the Hunger Gap Network, the national alliance of emergency food providers working to shift from a model of charity as the solution to hunger to a model of social justice. Together the network was able to establish a new grassroots-centered leadership structure, secure over 140 member organizations, embark on a narrative change strategy, organize regional networks and build alliances with progressive food access organizations and right to food advocacy organizations in the UK and Canada to strengthen and unify efforts to end hunger and address its root causes. WhyHunger provided logistical and technical support for delegates from our global allies the Rural Women’s Assembly and the Kuna Youth Movement to the 62nd United Nations Commission on the Status of Women to amplify their voice and perspective on women-led solutions to hunger on a global stage. We helped to organize a special meeting on Women and the Right to Food attended by 40 global allies from southern Africa, India, Panama and the United States to offer an opportunity for their voices to directly inform the Civil Society Report on the Efficacy of the Voluntary Monitoring Guidelines of the Right to Food released alongside the U.N. Committee on World Food Security’s report in the fall of 2018. WhyHunger continued its work to transform the dominant narrative about hunger in US from a model based on food charity to a model rooted in social justice and centered on dignity and human potential. By utilizing a story-based strategy WhyHunger organized with food access organizations across the US and led a national narrative change process to begin building a shared narrative and clear strategy that will progress in 2019. We expanded these efforts through WhyHunger’s storytelling and Food Justice Voices series, which released Neighbors Together on Hunger, Health and Housing in New York City to highlight the intersection of hunger, housing and mental health. WhyHunger continued to strengthen our individual donor base, which made up over a quarter of our budget in 2018. We’re proud to have grown our tribe of supporters, doubling our email list of donors and friends ready to learn, act and give. In 2018, we energized our supporters to protect SNAP benefits, press for a better Farm Bill, support agroecological farming and food production, and fight climate change. Hungerthon 2018 raised over $1 million for the third consecutive year, to fuel programmatic work and educate listeners through 30+ substantive radio interviews. The campaign’s success was bolstered by the support of broadcast partners SiriusXM, Entercom New York, Cumulus New York and iHeart Radio New York; artist ambassadors including Tom Morello, Jason Mraz and Michael McDonald; merchandise support from Yoko Ono Lennon, Bruce Springsteen and Tom Morello; and auction donations from an incredible array of artist, sports teams and celebrities including Hoda Kotb, Billie Eilish, New York Yankees, New York Giants, Mumford & Sons, Bob Weir, NASCAR, The Strokes, Kenny Chesney, Meghan Trainor. Artists Against Hunger & Poverty utilized the power of music and art in the fight to end hunger and poverty by engaging new artist ambassadors Sean McConnell, Chef Otto, Malinda Kathleen Reese, White Lightning, and Firepit and expanding its reach to an audience of tens of thousands of new fans through on-site engagement at concerts and festivals including the Q104.3 Breakfast with The Beatles concert, select Warped Tour shows, the Rockland-Bergan Music Festival, the Lettuce Tour, and the annual Spring-Nuts Seaside Serenade. In 2018, we honored Jason Mraz with the ASCAP Harry Chapin Humanitarian award for his commitment to food and social justice. WhyHunger kicked off a merchandise campaign with Hard Rock International and Bruce Springsteen for a “Land of Hope and Dreams” t-shirt, baseball hat and pin to be sold at Hard Rock locations around the world with a portion of proceeds benefiting WhyHunger’s programmatic work. The Summer Meals Rock for Kids campaign engaged artists and sports organizations such as Brandi Carlile, Bruno Mars, NASCAR, New York Jets and more to raise awareness and funds for the WhyHunger Hunger Hotline, which connect kids around the country to free, nutritious meals during the summer months. In partnership with the ONEHOPE Foundation and the Albertsons Companies Foundation Hunger Is initiative, WhyHunger made significant investments in grassroots solutions to hunger across America to support healthy food access, childhood nutrition, sustainable food production, and more. We also became an official charity partner of the TCS New York City Marathon, engaging four dedicated runners who raised over $10,000 to support our work.